This charming detached, contemporary holiday cottage has an open plan living area, luxurious bathrooms and two beautiful bedrooms. You’ll find handmade British soft furnishings with decorations in Farrow and Ball colours, granite worktops to the well-fitted hand made kitchen. There are two modern bathrooms with vanity cupboards. The comfy sitting area has a Sony LED HD Smart TV with freeview, DVD player, WiFi and a wood-burning stove. There is underfloor heating throughout and heated towel rails. The entrance door leads from a porch into the fully equipped, open plan kitchen with a Neff electric oven, induction hob, microwave, fridge, separate freezer, dishwasher and washer/dryer. The open plan kitchen leads to the sitting/dining room featuring the pretty wood burning stove, that is made up with logs ready to light, ensuring you are cosy throughout your stay. The master bedroom (ground floor) features a luxurious king size bed with Egyptian cotton linen, a snuggly designer throw, comfy pillows and duvet. This leads to a modern en suite bathroom with a large shower bath, vanity cupboard and w.c. The second bedroom (first floor) has twin beds and is open plan to its private staircase and lobby with an en suite wet room (ground floor). The spacious walk in shower has two showerhead options. This is a fun space with privacy from the ground floor living area. Automatic black out blinds add to the finishing touches of this unique bedroom space. Both bathrooms have heated towel rails, Egyptian cotton towels and welcome toiletries. Deerkeepers’ enjoys its own landscaped garden with terraces, outdoor furniture and a gas BBQ (during the warmer weather). There are country walks from the door onto a bridleway and the nearby Ashdown Forest (2,396 hectares). This cottage is in the gardens of an old coach house, which once formed part of a larger estate; therefore it has the benefit of a private tennis court and small home gym. Guests are welcome to use these at their own risk. For further information please contact the owner direct. Whilst we love dogs, we do not have pets to stay. Nor do we have smoking anywhere within the cottage. The cottage is unsuitable for young children due to the steps, stairs and wood burner. Older children are welcome. For further information please contact the owner direct. There is a detached one bedroom cottage close by, ideal for family groups and friends wanting independent accommodation. See Woodpeckers Cottage. I was raised on a farm so just love the countryside. Here we are very lucky living on the fringe of the beautiful 6000 acre Ashdown forest with wonderful walks and horse riding. The area is unbelievably unspoilt given its close location to London. The location is so peaceful and on a clear day you can see the South Downs. Walks straight from cottage door to private woodland, ideal for family picnics or lanes. Ashdown Forest is a 25 minute walk along footpaths. Forest Row is 3 miles. It has many small independent shops, cafes, pizzeria, restaurants and grocery stores. Underfloor plus heated towel rails in bathrooms. Radiator on first floor. Cotton bath sheet, hand towel and flannels per person. Treadmill, spin bike, cross trainer, weights, step, skipping rope. The table seats 4 comfortably, with 2 chairs and a 2 seater bench. Smart t.v. with Freeview and radio. 2 terraces, one with a bench and the main terrace with outdoor table, chairs and BBQ in the summer months. Thank you so much for your kind review and I am delighted you enjoyed your short stay with Mum. Best wishes. Deerkeepers Cottage is a gem. It is hidden away in the woods, is very quiet and really very charming. The interior decoration is to a high standard , the beds are comfortable, the kitchen well equipped. It has a lovely atmosphere and we spent five very happy days here before my daughters wedding. Thank you for your kind review of Deerkeepers, it was a pleasure having you to stay. I hope your daughter had the most wonderful memorable wedding and wishing her a very happy future. 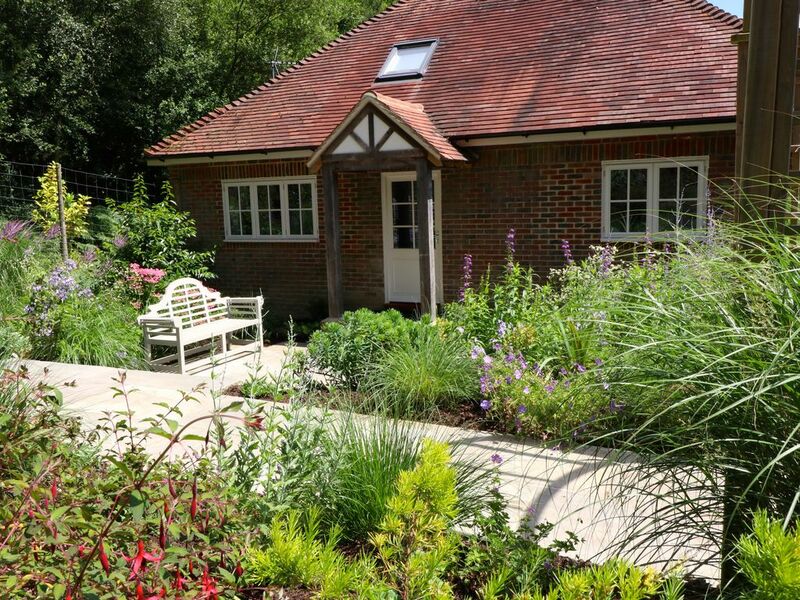 Deerkeepers cottage is beautifully decorated and in a lovely quiet location. We enjoyed walks from the door, buying produce from the local farm shop, spending time in the pretty garden and visiting the local attractions. Angie is the perfect host. We’re looking forward to a return visit. Thank you for your super review and I am so pleased you enjoyed your stay at Deerkeepers. It was a pleasure meeting you both and I am looking forward to your next visit. Plenty of space and everything you might need. Quiet location with good road links. A great place to host overseas friends visiting for a short while. Places to eat and chat inside and outside with immaculate gardens! Thank you for reviewing Deerkeepers and delighted it was a great place to host your overseas friends! Hope to see you again. Angie was so welcoming and willing to do anything to make our stay perfect. The little touches in the cottage were fantastic - including some food and wine; beautiful large towels; a well stocked kitchen; comfortable beds; everything was wonderful. The cottage was warm and the fire was beautiful. Deer keepers cottage is set in a peaceful and quiet location. We would highly recommend staying in this wonderful cottage. Thank you so much for your lovely kind review and I am so pleased you and your family enjoyed your stay. I hope to see you all again when you next visit England. Accomodation exceeded expectations and our host was very welcoming. The cottage is superbly located and surrounded by many places of interest. Thank you for posting a lovely review and really appreciate it. So pleased you enjoyed your stay and visiting the places of interest in this area. Hopefully see you again.